Half a lasagna, twice the taste. Tortellini, the Italian specialty and distant relative of the equally tasty dumpling, is without doubt a highly delectable treat for every pasta aficionado. Born and bred in the country’s northern Bologna region, it has by now become a staple of Italian cuisine. It comes with a variety of different fillings to choose from that range from dainty, melting parmesan and ricotta cheese and spinach to minced pork and chicken and is usually served in a hearty broth or with cream sauce. 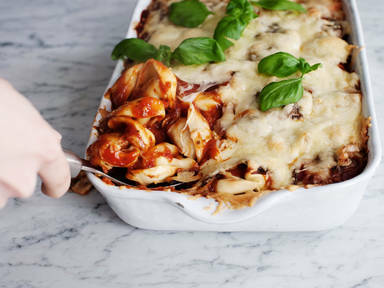 This rendition, however, takes its cues from another famous Italian pasta dish – lasagna to be precise. Our tortellini casserole might not score in the authenticity department, but it sure does in terms of yumminess. A generous helping of dainty melting cheese and tomato sauce will convince even the staunchest of traditionalists. Check out the video for the complete recipe.